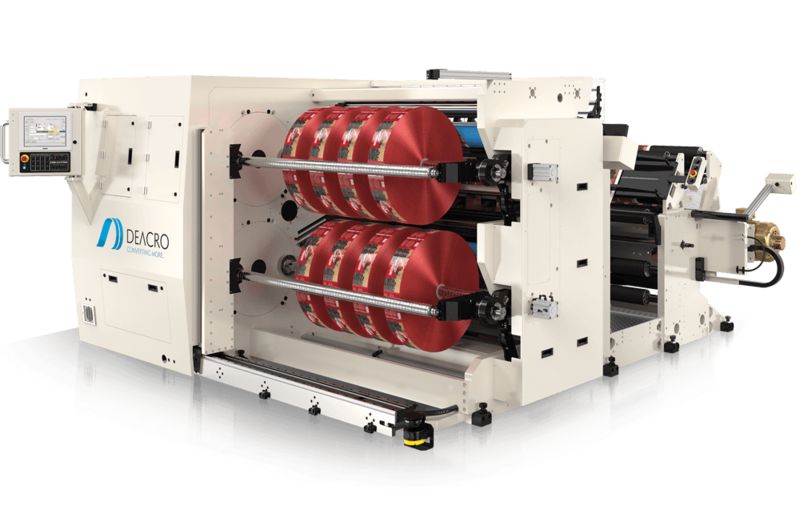 Deacro’s turreted slitter lineup includes the T800 for maximum versatility. The T800 has an automated rewind and the ability to accommodate large OD rewinds. 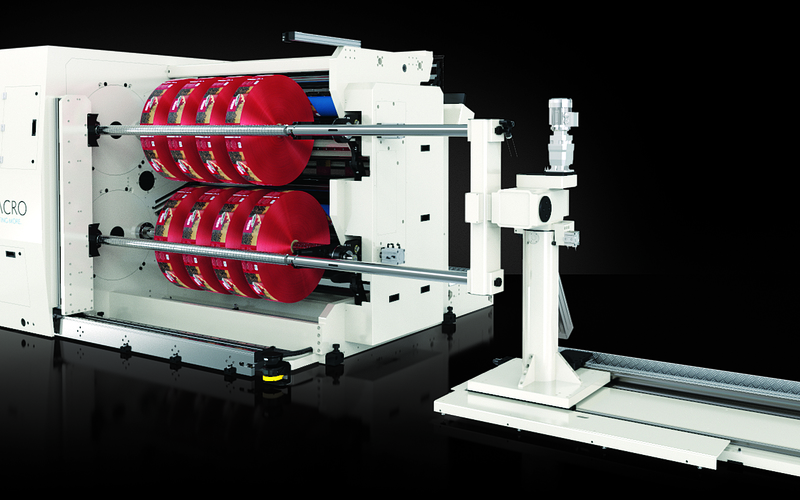 The duplex twin-turret provides the highest throughput by allowing unloading of finished rolls and setup of cores – while the slitter is simultaneously running web. 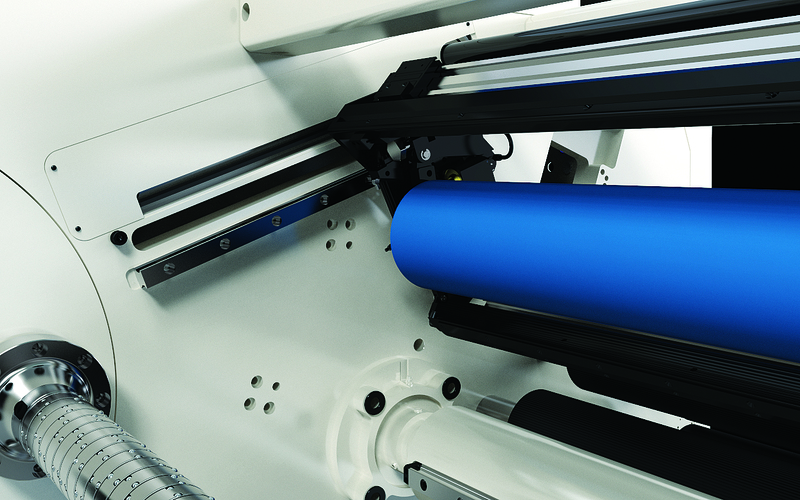 The rewind can be fully automated and optional downstream automation can be provided to handle the finished rolls. Traditionally, turret slitters have been designed for small roll rewinding. 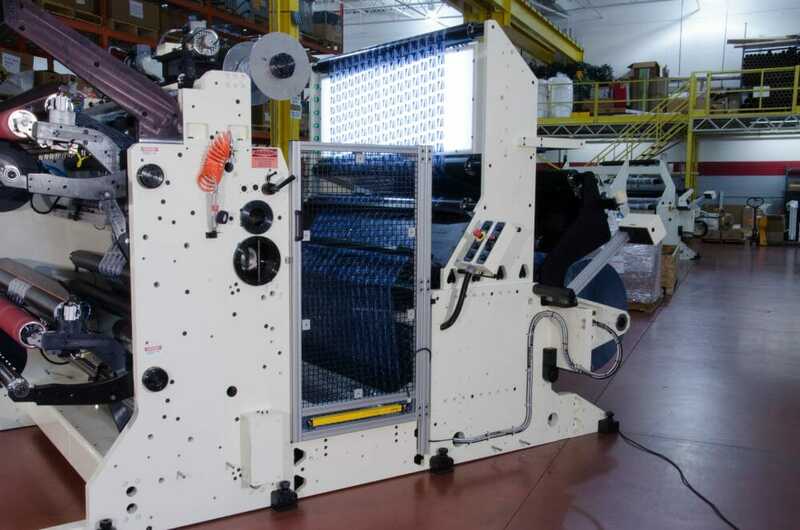 Deacro’s state-of-the-art model T800 turret slitter for wide web converting delivers the maximum in versatility, rewind quality and automation for rewind roll OD’s up to 31.5″ (800 mm). Features such as indexing outboard shaft supports and centre shaft supports, auto roll pushers and heavy duty roll receiving equipment allow large OD rewinding on the turreted slitter. 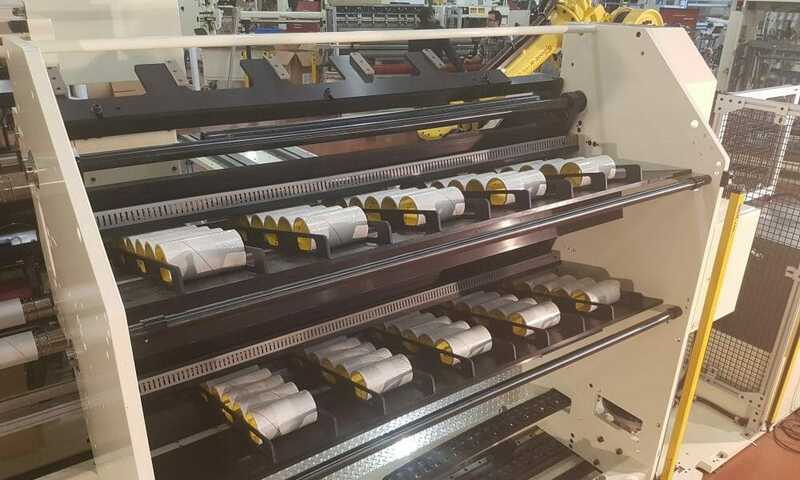 Automation options include web cutting, web transfer to cores, web taping for certain materials, roll unloading, core loading and core placement. 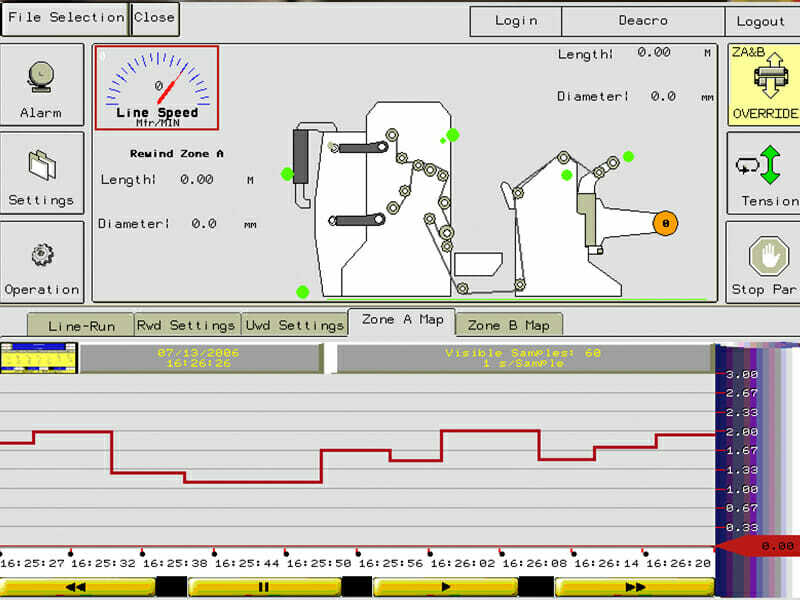 For shorter run applications, the setup can be automated as well including knife positioning and web guide positioning. 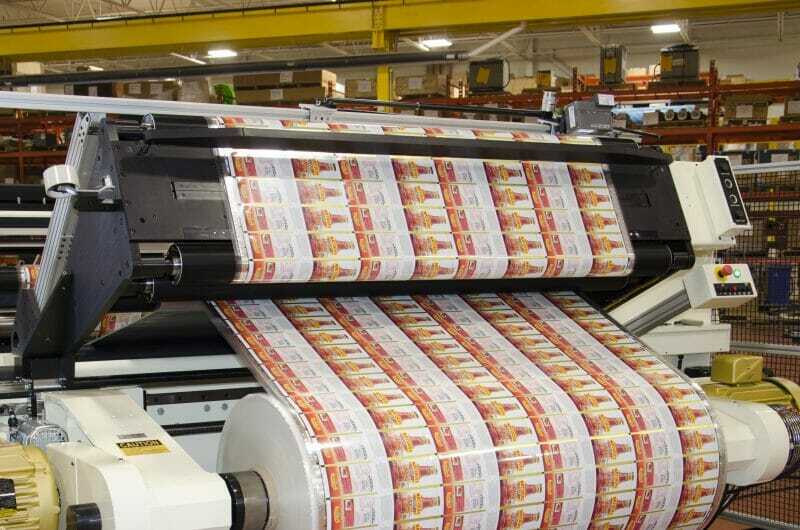 Downstream automation systems fully automate the roll packaging process. Auto unloading to a conveyor takes the finished rolls downstream for processing. 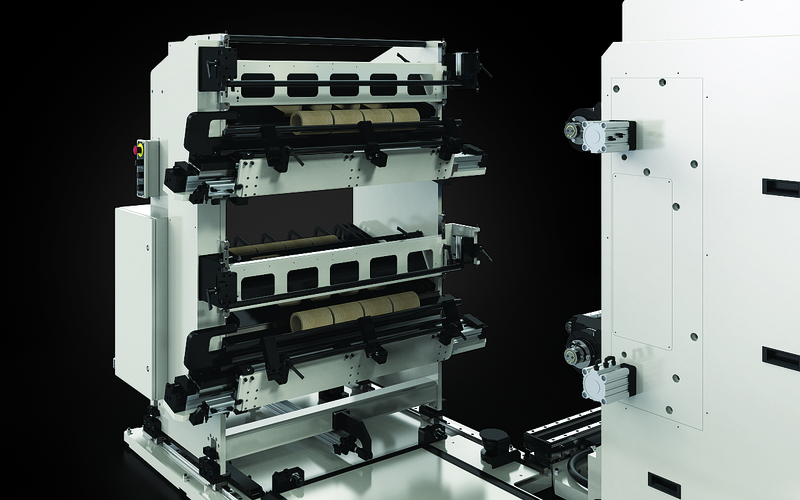 Fully automatic 6-axis robots palletize finished rolls. Auto roll weighing, labeling, wrapping/bagging and palletizing can be supplied as a turnkey solution customized per application requirements. Deacro’s roll lock differential air shafts are ideal for tension sensitive materials, clean running environments and rapid setup applications. Roll lock segments are stacked across the shaft eliminating the need to setup spacers. When rewinding is complete, the roll locks can automatically disengage for the finished rolls to be unloaded. Deacro offers a variety of designs for custom cores and with technology that can lock and unlock automatically and lock in forward and reverse winding directions. 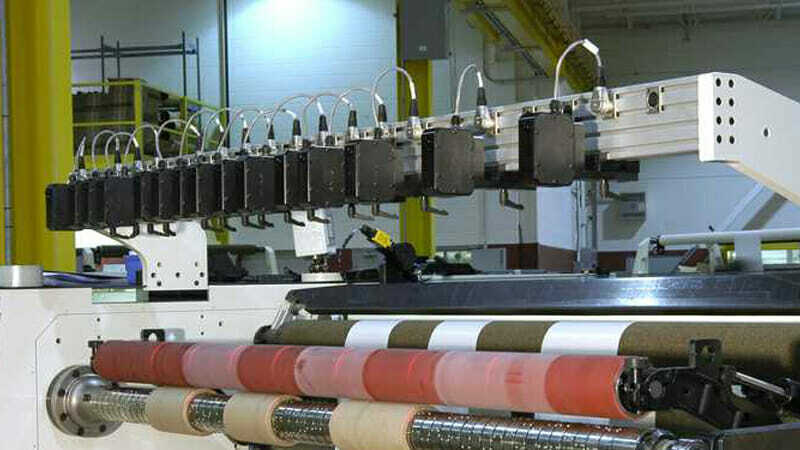 The closed-loop rewind tension control option gives operators the optimum level of control over the rewinding process. This option is particularly helpful for converters running tension-sensitive materials such as light gauge, extensible films. Load cells are used to read the actual tension and adjust the torque to the rewind shafts automatically for closed-loop rewind tension control. 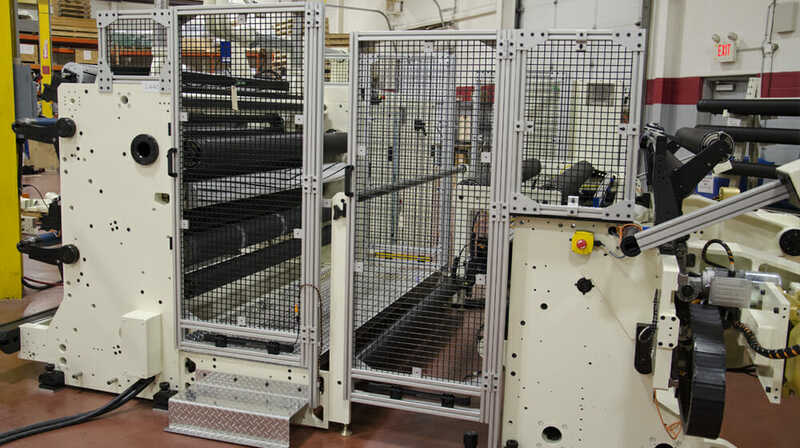 The slitter control system automatically adjusts the air pressure in the rewind shafts. This adjusts the rewind tension to match the load cell readings. This maintains the desired tension based on the base tension setting, taper tension setting and current roll diameter. Core can be automatically located on the rewind shafts by a variety of methods. A core hopper holds several sets of cores for fully automatic operation. Cores can be loaded as a set or individually depending on cycle time requirements. To reduce setup time, lasers can be supplied to indicate the rewind core locations. Operators simply line up the cores with the lasers. The servo positioning version eliminates the initial setup and positioning of the lasers. The operator waves a hand near a sensor to initiate the laser to move to the next required core position as saved in the file recipe to match the positioning of the knife locations. 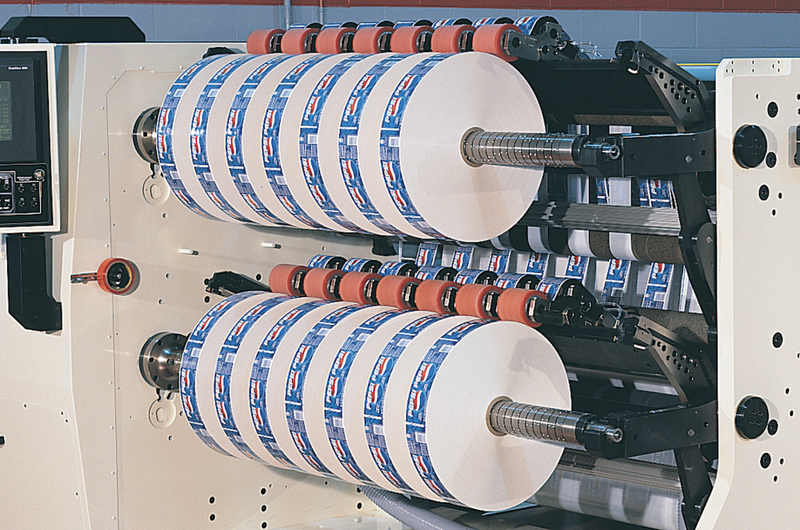 Automatic unloading of finished rolls onto a receiving tree can reduce the slitter downtime between set changes and provide increased safety for operators. The electric design provides smooth removal of the finished rolls at the touch of a button. Deacro offers a variety of web path options including the standard underfeed, optional overhead (for clean room applications) or an extended inspection web path option. Extended web paths can be used to add secondary processes such as web inspection while allowing defects to be stopped at a central location for web editing before defects reach the slitting section. To assist operators with quickly splicing in new master rolls, a rear position splice table is available. Pneumatic web clamps or combination vacuum system assist with quick and accurate splicing directly from the unwind location without needing to rethread the web to a downstream splicing location. Typically used for printed web editing, pneumatic web champs hold the web in place for the operator to perform quick and precise splices while keeping the print registration. Vacuum clamping is also available. Deacro offers a full range of safety features and options to ensure safe operation while maintaining operator access as required. Flexible designs use a combination of safety fences, gates, light curtains and programmable laser scanners to suit every application. 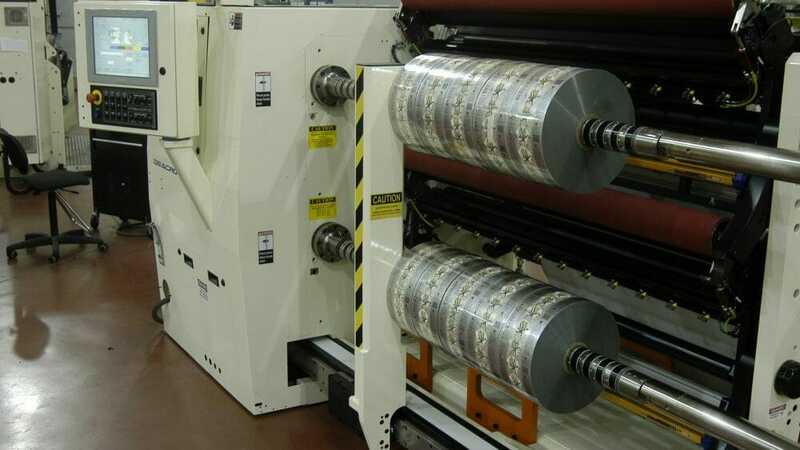 Deacro is the industry leader in the manufacture of slitter rewinders, slitting machines, salvage rewinders, and roll handling equipment for the converting industry. © 2019 Deacro Industries Ltd. All rights reserved.